where v(t) Instantaneous value of the voltage, in volts (V). ω = 2*π*f or ω = 2*π / T.
Φ Initial phase given in radians or degrees. This quantity determines the value of the sine or cosine wave att = 0. Here are a few examples to illustrate the terms above. Let’s see the time function using TINA’s Analysis/AC Analysis/Time Function command. You can check that the period is T=20m and that VM = 311 V.
Note that in this case the time function could be given either as v(t)=311 sin (314 t+Φ) or v(t)=311 cos (314 t+Φ), since in the case of the outlet voltage we do not know the initial phase. The following figure made with TINA shows the circuit with these time functions as TINA’s voltage generators. The voltage difference vAB= vA(t) - vB(t) is shown as solved by TINA’s Analysis/AC Analysis/Time Function command. Note that the peak of vAB (t) is approximately 294 V, larger than the 170 V peaksof the vA(t) or vB(t) voltages, but also not simply the sum of their peak voltages. This is due to the phase difference. We will discuss how to calculate the resulting voltage (which is Ö3 * 170 @ 294 in this case) later in this chapter and also in the separate Three-phase Systems chapter. Though an AC signal continuously varies during its period, it is easy to define a few characteristic values for comparing one wave with another: These are the peak, average and root-mean-square (rms) values. We have already met the peak value VM , which is simply the maximum value of the time function, the amplitude of the sinusoidal wave. Sometimes the peak-to-peak (p-p) value is used. For sinusoidal voltages and currents, the peak-to-peak value is double the peak value. The average value of the sine wave is the arithmetic average of the values for the positive half cycle. It is also called absolute average since it is the same as the average of the absolute value of the waveform. 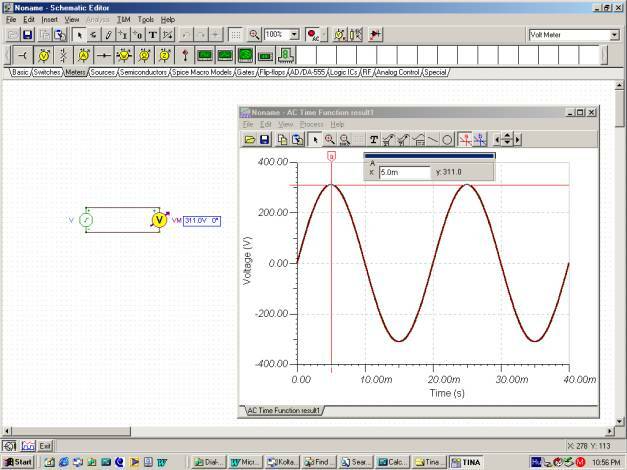 In practice, we encounter this waveform by rectifying the sine wave with a circuit called a full wave rectifier. Note that the average of a whole cycle is zero. These values can be calculated the same way for both voltages and currents. The rms value is very important in practice. Unless indicated otherwise, power line AC voltages (e.g. 110V or 220V) are given in rms values. Most AC meters are calibrated in rms and indicate the rms level. Example 1 Find the peak value of the sinusoidal voltage in an electrical network with 220 V rms value. Example 2 Find the peak value of the sinusoidal voltage in an electrical network with 110 V rms value. Example 3 Find the (absolute) average of the sinusoidal voltage if its rms value is 220 V.
Example 4 Find the absolute average of the sinusoidal voltage if its rms value is 110 V.
Example 5 Find the ratio between the absolute average (Va) and rms (V) values for the sinusoidal waveform. Note that you cannot add average values in an AC circuit because it leads to improper results. As we have already seen in the previous section, it is often necessary in AC circuits to add sinusoidal voltages and currents of the same frequency. Though it is possible to add the signals numerically using TINA, or by employing trigonometric relations, it is more convenient to use the so-called phasor method. A phasor is a complex number representing the amplitude and phase of a sinusoidal signal. It is important to note that the phasor does not represent the frequency, which must be the same for all phasors. A phasor can be handled as a complex number or represented graphically as a planar arrow in the complex plane. The graphic representation is called a phasor diagram. Using phasor diagrams, you can add or subtract phasors in a complex plane by the triangle or parallelogram rule. There are two forms of complex numbers: rectangular and polar. The rectangular representation is in the forma + jb, where j = Ö-1 is the imaginary unit. The polar representation is in the form Aej j , where A is the absolute value (amplitude) and f is the angle of the phasor from the positive real axis, in the counterclockwise direction. We will use bold letters for complex quantities. Now let’s see how to derive the corresponding phasor from a time function. First, assume that all the voltages in the circuit are expressed in the form of cosine functions. (All voltages can be converted to that form.) Then the phasor corresponding to the voltage of v(t) = VM cos( w t+f) is: VM = VMe jf , which is also called the complex peak value. where VM =VM e j r t = VM (cos(r) + j sin(r)) is just the phasor introduced above. However the complex time function has the great advantage that, since all the complex time functions in the AC circuits under consideration have the same ejwt multiplier, we can factor this out and just work with the phasors. Moreover, in practice we do not use the ejwt part at all--just the transformations from the time functions to the phasors and back. To demonstrate the advantage of using phasors, let’s see the following example. As this simple example shows, the method of phasors.is an extremely powerful tool for solving AC problems. Let’s solve the problem using the tools in TINA’s interpreter. The amplitude and phase results confirm the hand calculations. Now lets check the result using TINA’s AC analysis. Before performing the analysis, let’s make sure that the Base function for AC ia set to cosine in the Editor Options dialog box from the View/Option menu. We will explain the role of this parameter at Example 8. This example brings up one more issue. What if all voltages are given as sine waves and we also wish to see the result as a sine wave?. We could of course convert both voltages to cosine functions, compute the answer, and than convert the result back to a sine function--but this isn't necessary. We can create phasors from the sine waves in the same way that we did from cosine waves and then simply use their amplitude and phases as amplitude and phase of sine waves in the result. This will obviously give the same result as transforming the sine waves to cosine waves. As we could see in the previous example, this is equivalent to multiplying by –j and then using the cos(x) = sin (x-90°) relation to transform it back to a sine wave. This is equivalent to multiplying by j. In other words, since –j × j = 1, we could use the phasors derived directly from the amplitudes and phases of sine waves to represent the function and then return to them directly. Also, reasoning in the same manner about the complex time functions, we could consider sine waves as the imaginary parts of the complex time functions and supplement them with the cosine function to create the full complex time function. Let's see the solution to this example using the sine functions as the base of the phasors (transforming sin( w t) to the real unit phasor (1) ). As you can see, it is very easy to obtain the result using sine functions, especially when our initial data are sine waves. Many textbooks prefer to use the sine wave as the base function of phasors. In practice, you can use either method, but don't confuse them. When you create the phasors, it is very important that all time functions are first converted either to sine or cosine. If you started from sine functions, your solutions should be represented with sine functions when returning from phasors to time functions. The same is true if you start with cosine functions. Let’s solve the same problem using TINA’s interactive mode. Since we want to use sine functions as the base for creating the phasors, make sure that the Base function for AC is set to sine in the Editor Options dialog box from theView/Option menu.